This time we would like to introduce you with our Forex Scalping EA Strategy. It is new exclusive EA that includes fully automated scalping system for any currency pair. This EA is specifically designed for small time frames such as: M1, M5, M15, M30… It is great for forex beginners because it can work with small accounts and lot sizes starting as low as $50. Test was performed on live account using our partners PaxForex broker. You can start trading with micro lots such as 0.01 and grow up your account. (Check the video for presentation). Lots of settings: You can customize this Scalping EA Robot for your needs. You can change settings such as trading time, reverse the system and much more. You don’t need to track the market all the time and wait for the important levels to come in anymore, let the EA do it for You! This Forex scalping strategy robot can trade fully automated, you just need to set it up, put it on your favorite currency pair chart, choose the time frame you like, sit back and watch how it does its job. It has compact, but fully adjustable EA properties control. It is a great tool start for beginners to jump into auto trading. If you don’t know how to set up this EA don’t worry – there is .set file included and users manual guide so you have everything you need to get started! Check the back test results. In this test period Scalping EA produces no draw downs, the win ratio is 100%. Even with such a small account size with $100 initial deposit EA keeps stable and gains ~100% profit per month. Also we use our unique way to control the risks – when auto trading. You can choose how You would like to control the lot size management. It is possible to turn on or off lot rising mechanism. Every version of our software is able to trade with any time frame and any currencie pair as well as stocks, metals etc.. This EA will work with all the brokers that will support MT4 trading platform. All our EA’s can even trade multiple pairs at the same time separated by magic number. The software has special memory system which creates memory files and logs the trading process, so you never lose your trading cycle in case of platform crash or any connection problems. This is new Scalping EA version v3.0! This new EA includes latest list of settings and new money management info display. We have created very informative visual market info display so you could track every process that EA does. Also to have full and easy control, we have made even the user interface for you. You will be able to close all the trades EA made whenever you want with only single click, also you can restart the EA and start the trading process again. Scalping EA Version 3.0 also comes with new updated system core, which gives you even more stability and accuracy. We have also created special users manual guide for you. You will find there all the information and explanation for each parameter that this EA has. Each field is explained, what it does and how it would effect your trading. Start earning profit at the professional level. 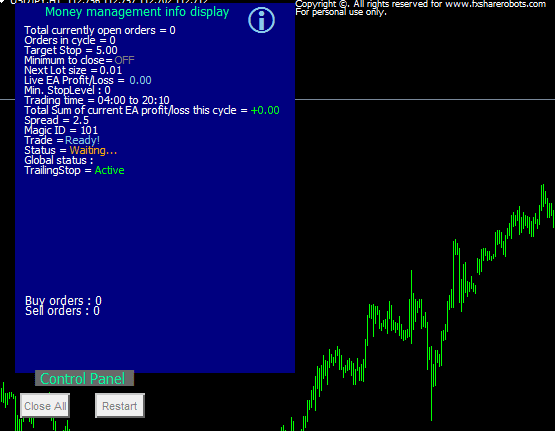 Get your own copy of: Scalping Strategy System EA v3.0. We strongly recommend to test your settings on back tester and demo before you run it live ! There is 1 .set file and users manual guide included – so you don’t have to worry if you do not understand all the terms of settings!